Deanna will be a featured author (as JJ Knight) at a book signing on the sea as part of BOOK SPLASH ALASKA. Several reader-author events will be planned as part of the seven-day cruise. Learn more about taking a vacation with Deanna at Book Splash. Deanna has the BEST TIME visiting schools and doing both presentations and keynote speeches at writing or reading conferences. She’s been an avid speaker since high school, and no crowd large or small, from the teeny toddlers to the professionals, can scare her! Speaking fees depend on the size of the audience and the length of the day. As a ballpark, you can expect a half-day to be $300 (plus travel if more than an hour from Austin, Texas). Speaking fees are reduced or waived in certain circumstances, particularly if the school or event will be sending out book order forms or selling books, or if the topic is particularly important to her. 4-8 year olds: Dust Bunnies: Secret Agents, a digital story book app from Polycot Labs. Adults: Deanna is a regular speaker on numerous topics from her adult books. She often speaks about miscarriage (by itself or in writing), epilepsy (from a parenting perspective) and about living life as an artistic creative person. She is considered an “inspirational” speaker. Writers/Publishing: Deanna regularly speaks on the subject of writing and marketing, particularly for independent self-published authors and small presses. She is a six-time USA Today bestselling author under multiple pen names for her self-published works. She owns her own publishing company and is also a founding partner of another middle-grade press. Deanna spoke to t he Writers Special Interest Group of the National Speakers Association about creativity and marketing stories. Deanna taught her workshop “Making Heroes Out of Misfits” to several groups of second and third graders at Eden Park Academy. Deanna participated in the panel “Speed Drafting” at the Society of Children’s Book Writers and Illustrators monthly meeting. Deanna participated in the panel “Marketing Your Novel” at the Writers League of Texas monthly meeting. Deanna participated in the panel “Identify Your Audience and Market Your Book” at the Writers League of Texas Agents and Editors Conference along with Caroline Casey (Coffee House Press), Colleen Devine Ellis (UT Press), and Elena Meredith (Publicist). Deanna taught a class entitled “Succeeding in the Current Self Publishing Market” at St. Edward’s University for the Writers’ League of Texas. Deanna was the guest on the Up Late Austin cable show with host Jake Martin. Deanna is signing her new book FOREVER BOUND at the Literacy Signing at the Romance Writers of America National Convention. She is also moderating a panel on Saturday, June 25 during the convention. Deanna taught a workshop titled “Ten Characteristics of Highly Successful Self-Published Authors” at the Writers League of Texas Agents and Editors Conference. Deanna was a featured author at An Austin Author Event book signing at the Renaissance Marriott Arboretum. Deanna taught a workshop on Self Publishing for the Austin Arts and Service Celebration, a week of classes where veterans learn more about working in the arts. Deanna taught a half-day class for the Writers League of Texas called Writing What You Love in Marketable Packages. Deanna was a panelist on Alternate Publishing Options at the SCBWI monthly meeting at Bookpeople. Deanna signed FOREVER SHELTERED at the Literacy Book Signing at the Romance Writers of America National Convention. 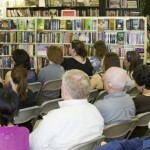 Deanna was a panelist on self-publishing at the Writers’ League of Texas Third Thursday meeting at Bookpeople. Deanna was a panelist at the Writers’ League of Texas Agents and Editors conference on the topic, “Big House, Small House, My Own House” with editors Jill Meyers, Jason Pinter, and Michael Signorelli in the Hyatt Regency Texas Ballroom. Deanna had two fan events at the Romantic Times Book Lovers Convention. Deanna was a part of a panel on publishing with the Lake Travis Fiction Writers. Deanna was at the Texas Book Festival as part of the Writers’ League of Texas booth events. The Society of Children’s Book Writers and Illustrators Digital Conference: The Nuts and Bolts of Success. Deanna conducted a one-hour presentation in the morning on “Marketing Your Digital Story Book” as well as lead a hands-on activity with attendees in the afternoon to create a story time presentation sure to turn visitors into fans. 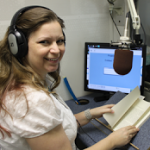 Deanna was part of a panel on publishing in the modern era for the talk show Writing on the Air. Go listen to the broadcast! Deanna presented her Digital Storybook app Dust Bunnies Secret Agents to six kindergarten classes. In one day! And didn’t die from cuteness overload! Deanna was invited to do the story time at this environmentally friendly baby store with Dust Bunnies: Secret Agents. Deanna presented Dust Bunnies: Secret Agents to four kindergarten classes. Deanna participated in a Record-a-Thon fundraiser for the blind and dyslexic along with local celebrities and Louis Sachar, author of Holes. 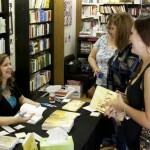 Deanna launched her adult novel Baby Dust. The SCBWI Digital Conference. Deanna led a one-hour presentation on “Standing Out in the eBook Crowd” to writers and aspiring authors.